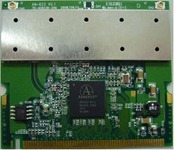 The XN-623 is an IEEE 802.11b/g/n draft 2.0 compliant mini PCI adapter supporting a throughput rate of up to 300Mbps and operates in the license exempt WiFi bands in the 2.4GHz range of IEEE 802.11b/g networks. It also utilizing the MIMO (Multiple-input multiple-output) design implementation with it's 2 U.FL-R SMT Compliant antenna connectors. Based on the advanced MIMO technologies, XN-623 provides 2 external antenna connectors as option, which ensures not only the optimization of the speed, but also the maximum coverage.